This is not a recipe, it is just a combination I love. The perfect salad to have on hand all summer. A mandolin makes quick work of producing paper-thin slices – I keep my mandolin on my countertop and use it everyday. Seasoned rice vinegar has a mere 20 calories a tablespoon so indulge to your heart’s content..
You will have a fair amount of juice/vinegar at the bottom of the bowl. If you want to be thrifty, reserve and add more cucumbers and cilantro. Seasoned rice vinegar is low acid and balanced with salt and a bit of sugar. 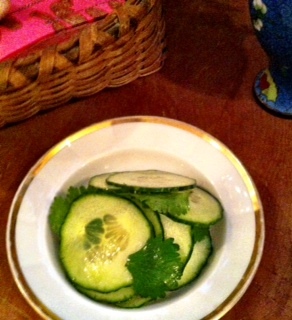 This entry was posted in Recipes and tagged Cilantro, Cucumber, salad, Seasoned Rice Vinegar, Summer Salad. Bookmark the permalink. So light and fresh tasting! Thanks Emily.